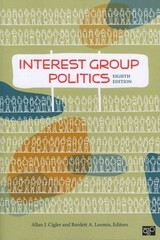 Interest Group Politics 8 Edition After a turbulent and moneyed midterm election season, turn to the new edition of this trusted classic to guide your students through the influence and reach of interest groups. With its broad spectrum of scholarship on interest groups past and present, Interest Group Politics once again brings together noted political scientists to provide comprehensive coverage and cutting-edge research on interest groups in U.S. politics. Contributors examine the growth of social networks in lobbying, the actions of organized interests during the health care reform debate, campaign mobilization and congressional decision making from the group perspective, and more.